Very creamy and delicious like eating toast with fluffy whipped cream :) Yummy!!! 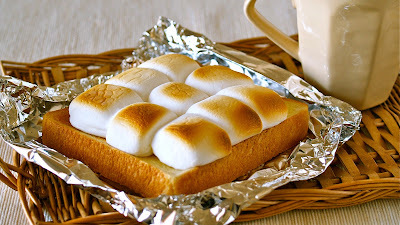 I love the combination of salted butter and sweet marshmallows~ but it is up to you! If you like sweet stuff, you can layer jam, nutella, or whatever you like. Of course, only marshmallow is very good. Please use a toaster oven or a gas oven (I used fish grill). NOT a conventional (electric) oven since it cooks slow. 1. Toast the bread until golden. Then butter the bread if you like. 2. Place marshmallows on the bread. Toast until the marshmallows are golden brown.